A thankful attitude opens the windows of heaven. Spiritual blessings fall freely onto you through those openings into eternity. When we look to the Lord with a grateful heart, we can get glimpses of glory through these windows. Thankfulness is not some sort of magic formula; it is the language of love, which allows us to communicate intimately with the Lord Jesus. A thankful mindset does not deny all of the problems that exist in our lives today, rather it rejoices in the Lord in the midst of the problems. He is our refuge and our strength and our ever present help in times of trouble. 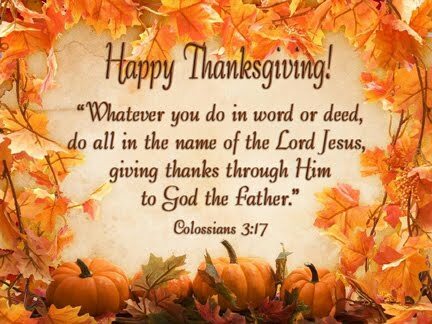 I hope that all of you have a blessed and Happy Thanksgiving Day!!! !